Who Doesn’t Knead a Good Massage? Massage therapy is a powerful tool for rehabilitation. From therapeutic deep tissiue to mild relaxation, our registered massage therapists will help untie your knots. Effective for relaxation, injury recovery, and pain relief. One of man’s oldest methods for relieving aches and pains, massage therapy is a powerful tool to promote healing and improve quality of life. Our massage therapy services are performed by licensed massage therapists and are benefits applicable as a result. Note that not all benefits programs are the same; confirm your coverage with your provider. We offer direct billing to Alberta Blue Cross, Green Shield Canada, Great West Life, Sun Life, and more. Many sources of nagging pains, often including chronic pain, benefit from massage therapy. In conjunction with other types of therapy – physiotherapy and physical therapy (where appropriate) – massage is a power rehabilitative tool. Massage promotes a relaxation response, which calms the body’s circulatory system. This is thought to reduce the affects of stress and help stabilize mental health. Manual manipulation of the muscle groups works by improving blood and lymph system circulation, improving the vibrancy and efficiency of your muscles and organs. 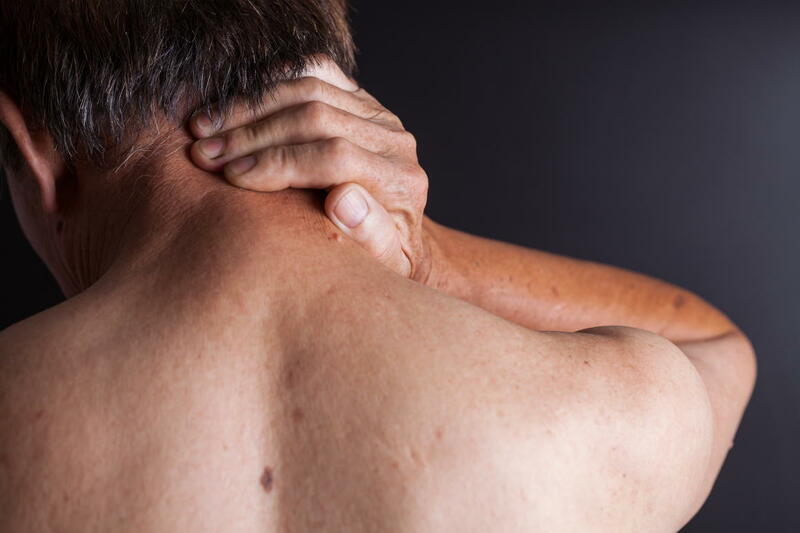 Neck strain / "text neck"
Sprains and muscle pain are often caused by repeated stress injuries, extensive technology use, and sports injuries. Good news: we can help! Physiotherapy utilizes several treatment methods to reduce inflammation and ease pain. Promoting a safe and strong recovery. Our registered massage therapists are skilled in all manner of massages. From relaxation to reflexology. An effective way to help stuck muscle fibres release. Many Calgarians find stress and pain relief via acupuncture and IMS. Find relief from chronic pain! Pain management through physiotherapy, massage, acupuncture/IMS, and more. Pain in your back, neck, and joints can have multiple sources and associated treatments to relieve pain and promote healing. The right orthotic can make an immense difference in posture and comfort. Determining loss of function, disability management and return to work ability requires a functional capacity evaluation. The best massages and Margret has fixed my back many times with acupuncture which am very grateful for!!!! The team here is very knowledgeable and have convenient hours and are super friendly would recommend this clinic to anyone looking for relief thanks guys!!!!! I would like to take this opportunity to express my extreme gratitude and satisfaction for the level of physiotherapy services (acupuncture, heat and electrical stimulation, ultrasound treatment and a prescription of a specific exercise techniques to battle my nasty case of sciatica) I received from you. Can Physiotherapy Help My Jaw or TMJ Pain?